Don Winegarner’s new book “The Iron Doll” is unnerving and will chill the reader to the bone. Recent release “The Iron Doll” from Page Publishing author Don Winegarner is a mesmerizing and hair-raising tale about a killer on the loose in a casino constructed on an ancient Indian burial ground. 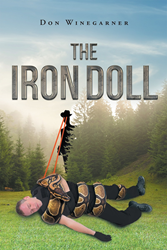 Don Winegarner, a devoted writer and author, has completed his new book “The Iron Doll”: a gripping and exhilarating book of murders and mystery. Will this monster ever be caught? Will the casino ever be built? Although Don Winegarner didn't graduate from high school, and worked at miscellaneous jobs throughout his adult life, Don wanted to accomplish something that his family and friends could be proud of. That certain something came to him while he was at work. At the same time, Don was thinking about how he wanted a snake tattoo wrapped around his body, with the head of the snake on the side of his neck. He noticed a tattoo on the arm of a coworker, who was passing by his work station. After talking for a few moments, she began to walk away and Don caught another glimpse at her tattoo. The sway of her body gave the impression that the tattoo was moving. Don became inspired to write a book and reach that goal of making people proud of him. Another sign that writing this book was a good idea, was when he came up with the title. He realized that he already had a clear idea of what the main character should look like; the cowboy statue his father made while working at a foundry. Don was never interested in reading a book, never mind writing one. So, when he finally finished after eight long years, he knew he reached his primary goal. Not the one of making other people proud, but having pride in himself. Published by New York City-based Page Publishing, Don Winegarner’s thrilling tale will have the reader on the edge of their seat until the very end. Who is the murderer? Will Sue’s husband make it out alive? There is a new casino being built in Dodge. Since it is connected to an old Indian burial ground, there are mixed feelings about if it should be built or not. There are strange stories that have been told about Dodge, and people are worried. One person in particular is Sue. She doesn't want her husband, Jim, to work for Paul at the construction site. Paul just wants to do his job and get the casino built. However, something or someone is killing off his workers; which has Sue worried even more. The authorities have shut down the construction site until this monster is caught. How can they catch a monster that is a toy statue one minute, and a larger than life iron demon the next, who seems to have trouble staying in one city? Only time will tell if the casino will ever be built. According to Paul's boss, that time is running out. Readers who wish to experience this chilling work can purchase“The Iron Doll” at bookstores everywhere, or online at the Apple iTunes store, Amazon, Google Play or Barnes and Noble.